Here in our household, pets are part of the family. Just in case you were wondering about the title of this post. 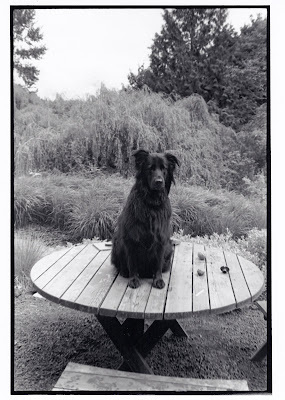 We had a string of wonderful black mutts in my childhood but this was the first one that was really mine. I picked her out from the litter of a backyard breeder (yes, I know: awful. ), and she was the cutest fuzzball I'd ever seen, half newfoundland, half something else. Her hair was newfy length (and color, obviously) but she had the lean build of something..ah, a bit lighter on it's feet than the traditional newfy. She wasn't beloved by the rest of the neighborhood or by our older, mature dog. But she was mine and I loved her dearly. The problem, though, with the very big dogs, is that they don't live very long. Want a lifelong companion? Adopt a parrot. Or a small dog. She died of a brain tumor after only nine years, and as I was in Anchorage for the summer, without a chance to say goodbye.